Reflection is a critical piece of the experiential learning model, as that is where learners construct their knowledge gain. An activity, without this core component, is just that- an activity. An activity in which it is unclear what the learner has gleaned, if anything, and without the opportunity for the learner to connect that new knowledge to an interconnected web of other pre-existing knowledge. 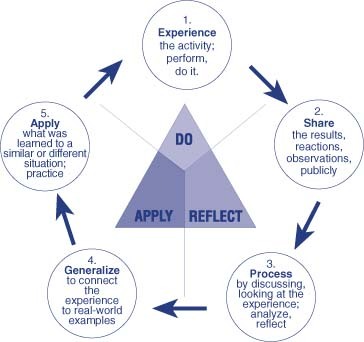 From this diagram, you can see that reflection and application combined, are actually 2/3 of the entire learning experience, while the “Do” (the activity) is 1/3. Thus, it is critical that we are effective at facilitation reflection and application. Facilitating reflection takes study, and it takes practice. On March 26th, the American Camp Association is hosting a webinar with phenom of the camping world- Scott Arizala, titled, “What Just Happened? Reflections that Stick.” Click on the title link for registration information. Neva exposed me to Scott Arizala through a previous ACA conference, and I found, and I think you will to if you are able to attend this webinar, quite impressive! This entry was posted in Professional Development, Youth Development and tagged camp, experiential. Bookmark the permalink.